1. Glazar, P., P. Papavasileiou, andN. 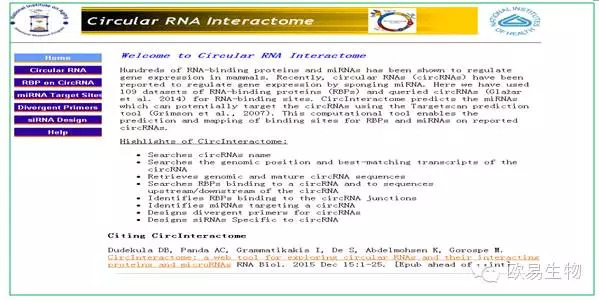 Rajewsky, circBase: a database forcircular RNAs. RNA, 2014. 20(11):p. 1666-70. 2. 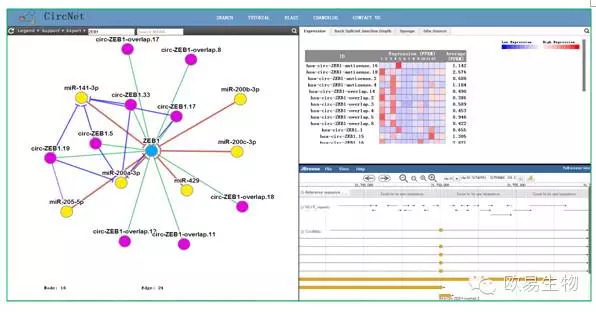 Li, J.H., etal., starBase v2.0: decoding miRNA-ceRNA,miRNA-ncRNA and protein-RNA interaction networks from large-scale CLIP-Seqdata. Nucleic Acids Res, 2014. 42(Databaseissue): p. D92-7. 3. Ghosal, S., etal., Circ2Traits: a comprehensivedatabase for circular RNA potentially associated with disease and traits.Front Genet, 2013. 4: p. 283. 4. 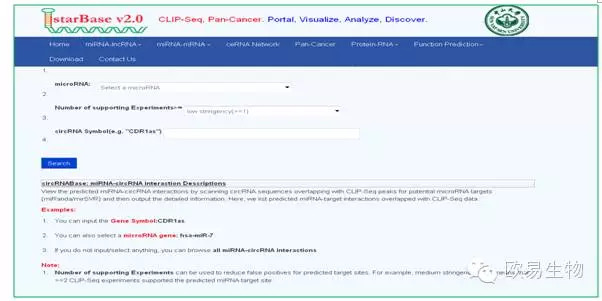 Liu, Y.C., etal., CircNet: a database of circular RNAsderived from tranome sequencing data. Nucleic Acids Res, 2016. 44(D1): p. D209-15. 5. Zheng, L.L., etal., deepBase v2.0: identification,expression, evolution and function of small RNAs, LncRNAs and circular RNAsfrom deep-sequencing data. Nucleic Acids Res, 2016. 44(D1): p. D196-202. 6. Dudekula, D.B.,et al., CircInteractome: A web tool forexploring circular RNAs and their interacting proteins and microRNAs. RNABiol, 2016. 13(1): p. 34-42.